Colombia Farm Friendly project is the latest to help coffee communities. Colombia Farm Friendly Project is our latest initiative to help improve the quality of life within the communities where our coffee is grown. The Human Bean is proud of our Farm Friendly Direct program. This program was created to make a positive difference in our coffee world. This is done through both socially responsible and direct coffee sourcing. This sourcing comes straight from the growers. Additionally we fund many improvement projects in these communities. These projects provide clean water, solar energy, education and more. Colombia is the 12th country where we have funded a project like this. Part of the Farm Friendly Program is sourcing our coffee directly from the farmers. This also involves paying growers a premium for their coffee. 100% of that premium is then going to farm and community projects. This direct purchasing relationship is mutually beneficial both for The Human Bean and the grower. A consistent and constant supply of the highest quality coffee is then guaranteed to The Human Bean. The growers and their local communities also receive above fair-market pricing. 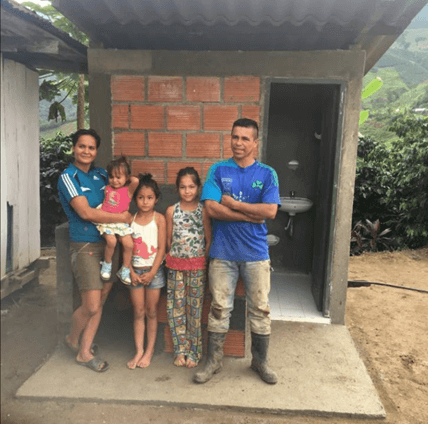 The Colombia Farm Friendly Project consists of building and also repairing septic and sanitary units within coffee growing communities. This is a three year project. The goal is to build 55 total new units. We are currently at 73% progress of our goal. We are in the process of building four out of six new septic tanks. 21 out of 27 new sanitary units are complete. Lastly, we have repaired 15 out of 22 sanitary units. The units provide a quality of life increase for all of the farmers and community members where they are built. In addition, we have also done many other projects like the Colombia Farm Friendly project. These include putting in shade trees in El Salvador, placing water wells in Tanzania and building a “fun pump” which produces clean water through children playing on a merry go round in Kenya and school supplies for an orphanage in India. While it may not seem like it when you are sipping on delicious mocha, your purchases have helped support us in community projects all over the world. Providing an ethically sourced cup of coffee is important to us and you as our customers help make this happen.